Fall Wedding approaching? Or maybe an Autumn or Fall themed Party? 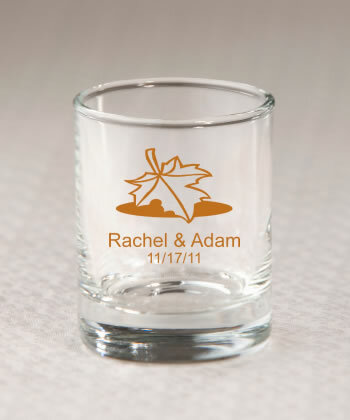 This Round shot glass/votive candle holder is perfect as a wedding favor and a keepsake for your guests. The item is NOT individually boxed. Customized by Professional Glass Workers. The Custom Designer (select large Blue Button that says LAUNCH DESIGNER to open) will fill in the menus under 'Personalized Options' below, but you can select 'Personalized Options' to review the information being sent after using the 'LAUNCH DESIGNER' button which allows you to customize your products on your screen. Personalized and Custom Glassware has no set-up charge. Always order more than you need since glassware can sometimes have a defect. Personalized glassware can not be returned. We do not correct spelling or punctuation, capital letters, etc. However you enter any personalized text is how it will be printed. Be sure to check your entries. Note: Custom Glassware has a processing time of 10-14 days.